Wherever you go in the north of Australia there seems to be cattle, cattle and more cattle. did you know that Australia is the world's second largest exporter of beef (Brazil is the largest)? 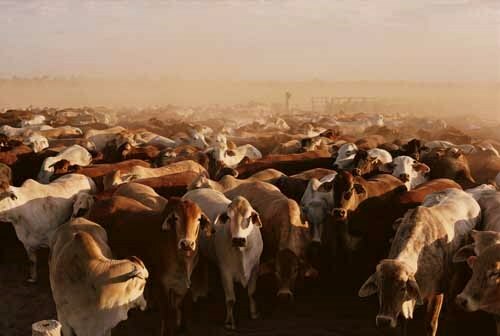 In land area terms the largest cattle stations are found in Australia, primarily because we are the driest and oldest continent on earth so large expanses of land are needed to support sufficient numbers of cattle to earn a reasonable living. The less frequent and less reliable the rainfall and the older the soil, the larger the stations are. The very largest cattle stations average 10,000 square kilometres in area and they run between 20,000 and 100,000 head of cattle. Almost all the largest stations in Australia are owned by companies because of the large amounts of capital required to run them. Northern areas are completely dependent on ‘wet season’ rainfall. Cattle are born, raised and fattened with very little impact on the natural environment because they are on native grassland in huge paddocks that can measure many kilometres across. Due to the distinct wet/dry season there is relatively little trouble with diseases and parasites so scant chemical treatment is required. Tick-free regions such as Queensland's Channel Country are naturally organic, and have always been so. 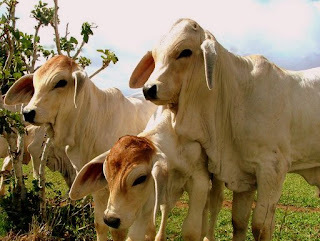 In northern Australia the cattle breeds you mainly see are the long-legged smooth-coated Bos Indicus based cattle breeds (Brahmans, Santa Gertrudis, Droughtmaster etc). The landscape ranges from vast, naturally treeless blacksoil plains growing Flinders and Mitchell grasses, (referred to as ‘downs’ country), to rocky hills covered in spinifex, ghostgums and coolamon trees, to dense grey mulga scrub, red sandhill country, lignum and coolabah swampy channel country, to dusty nondescript scrub of bullwaddy, lancewood, gidyea or eucalypts and wattles. Tropical savannahs encompass around 1/4 of Australia, stretching from the Indian Ocean in the west to the Pacific in the east. They border desert country to the south, rainforest on the east coast and are fringed by floodplains and peppered with monsoon forest patches in the north.